It is never easy to emerge from the considerable shadow of Henry VIII, but it’s fair to say that during her brief life, the mighty king’s younger sister Mary tried her damndest to seize at least some of the attention. Unlike Elizabeth Woodville, as recent fiction work might have you believe, Mary Tudor truly was known as the White Queen during her lifetime, referred to by the French for the colour of her mourning clothes after the death of her husband Louis XII in 1515, and it is this particular Tudor queen that author Sarah Bryson chooses to explore in her latest work ‘La Reine Blanche; Mary Tudor, a Life in Letters’. The author notes in her introduction that the Tudor age was a period dominated by men, but there were nonetheless many strong, independent and intellectually gifted women, one of which she asserts was Mary, the youngest daughter of Henry VII and Elizabeth of York. As this book, a chronological biography, progresses, it is difficult to argue otherwise with Bryson’s opinion. La Reine Blanche covers Mary’s life, and in fact pre-life in the case of the opening chapter exploring the origins of the Tudors, following her early life as part-princess, part-martial pawn, including a commendably detailed look at her childhood betrothal to Archduke Charles, before exploring her brief tenure as Queen of France after she was married at eighteen to the elderly Louis XII in October 1514. The union was part of a treaty between Mary’s brother Henry VIII and her new husband, but the French king only lived three more months. Mary, however, was proud of her rank as Queen of France, and in fact, Bryson tells us, she never stopped referring to herself as such, despite a subsequent marriage. That remarriage was her controversial decision to wed Charles Brandon, her brother’s close friend and the parvenu Duke of Suffolk, shortly after King Louis’ death, behind the back of the English king to whom they were forced to beg for forgiveness after the fact. What does this impulsive act say about Mary Tudor, a renowned beauty? Bryson tells us it proves it was an “opportunity to show the strong, self-willed, determined woman she had always been”, and this is an understatement. It was a remarkable decision, followed by a fascinating period in which she was forced to beg her brother’s forgiveness through a series of letters. It is these letters where Bryson’s book has particular worth. Too often narrative history books only carry the odd line or two of contemporary sources, and often even then it is a famous excerpt that is repeated across the board. Bryson has utilised scores of letters written to and from Mary, or involving matters relating to her, and more often than not has included them the source in full, which is refreshing in allowing the reader to formulate their own opinion on the topic in question. In short, we are treated not only to Mary’s story in Bryson’s words, but also Mary’s story in Mary’s words. We also discover, through these letters, just how wise Mary was, conjuring up all her wiles to convince her brother to forgive her marriage to Brandon, flattering him until he submitted. Bryson is astute when she notes that Mary “was able to manipulate the men around her, to convince them of her loyalty and to gain her heart’s desire by playing the weak female. She wept, she feared for her life, she worried and played herb role perfectly, all the while manoeuvring the men to her purpose; a marriage of her own choosing”. Tudors more often than not got their way, and Mary was no different, even when the person she was up against was her own flesh and blood. How many others went against Henry VIII and lived to tell the tale? 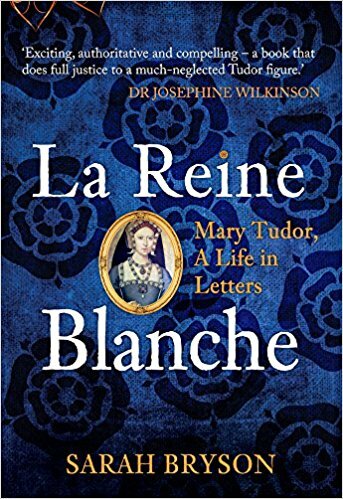 In short, La Reine Blanche is a passionate and detailed account that is a welcome addition to the Tudor genre, in which Sarah Bryson does justice to the extraordinary life and times of Mary Tudor. Essential reading to gain a fresh perspective of the early years in the most famous royal court in English history. Sarah Bryson is a researcher, writer and educator who has a Bachelor of Early Childhood Education with Honours. She currently works with children with disabilities. She is passionate about Tudor history and has a deep interest in Mary Tudor, Charles Brandon, Duke of Suffolk and the reign of Henry VIII and the people of his court. She has run a website dedicated to Tudor history for many years and has written for various websites including ‘On the Tudor Trail’ and “QueenAnneBoleyn’. She has been studying primary sources to tell the story of Mary Tudor for a decade. Sarah lives in Australia, enjoys reading, writing and Tudor costume enactment.